2608 days and 1125 updates later, the curtain comes down on Fragile Gravity. It’s been a hell of a run, I want to thank all of you for checking in on the world of Glidepath over the years. Gregg and Tanya taught me a lot about perseverance throughout a creative endeavor, a lesson which will carry me on to the next big project, and I invite all of you to tag along. Unseen Productions new webcomic, Sledgebunny, premieres on Monday, January 11. (01-11-10) It’s a very different format – a graphic novel in full color, which will demand that I step up my game. I think Fragile Gravity fans will find themselves right at home. Our new protagonist inhabits a different world than Gregg and Tanya’s, but once you look past the surface I think you’ll find more similarities than you might expect. Alright, kiddies, that’s about it. Thank you all for making us a part of your week over all these years, and a big thank you to many people in the webcomics and convention communities who have helped us out – there are too many of you to name. Laters! See ya on the 10th! Change [cheynj]: to make the form, nature, content, future course, etc., of (something) different from what it is or from what it would be if left alone. Here we are at the end and I’m updating my section for the very last time. I’m very horrible about updates, but this is important (not to mention it’s the one that will be stuck here on the page). Let’s talk for a few minutes about change. Change is necessary. Without change, characters stagnate and die. The first major change in our strip was Lana. She went from a two-dimensional carafe-hurling harridan to a caring human being. This isn’t to say that all the violence and anger was removed, but she was softened enough to grow as a character. Over time, we’ve seen the good and the bad of many of the characters, but it was all in the name of growth. Hopefully, they’re all a little better for it. Change is frightening. If left to my own devices, I could have stretched this strip on for years and years. There were so many other things that could have come up: a rival studio, Hollywood battles, foreign venues, a plague of lemmings... but it would have felt forced. Fragile Gravity is like a comfortable pair of shoes; it’s so very tempting to wear them until there’s nothing left, but it doesn’t get you very far. I dearly love the gang from Glidepath and I’m sure we’ll see them again, but I never want them to wear out their welcome. However, in the end, change is good. It allows us to move forward and explore new avenues; it also lets us look back and appreciate what’s gone before. 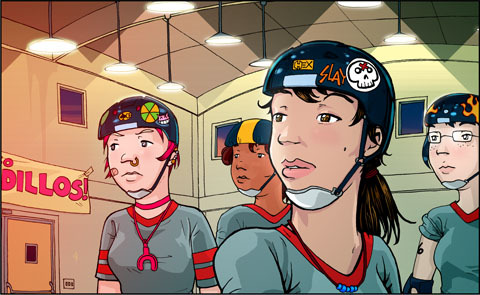 Our new comic is a world of change and we hope you’ll come along for that ride as well. • April Fools! Here are our 2003, 2004, 2005 bits. • Avast! In honor of "International Talk Like a Pirate" day, we provided an extra strip; get out and be flyin' your pirate colors!. • Boo! Our special Halloween strip with contest winner David Muniak..
• Happy V-Day! This was from the Comixpedia Blind Date with me doing the adaptation and the magnificent Sahsha Andrade from Nekko and Joruba doing the art..
• Neko the Kitty goodness! Our guest strip at Neko the Kitty..
• One hundred strips! Our 100th strip celebration graphic. • Web Comic Awareness Day! Here's our 2003, 2004, and 2006 strips. ©2002-2019 Unseen Productions, LLC. All rights reserved.